Mike Brown is a transportation engineer and sponsor of Strong Towns through his firm, Metro Analytics. Today, he's sharing a guest article with what might be a surprising perspective on one-way streets. Check out the previous articles in our ongoing conversation about one-way streets here. In the rush to convert one-ways to two-ways, I worry we’re trending the wrong-way. “One-ways bad, two-ways good” is almost a tribal chant now, and it’s getting a little loud. The rush to convert is an understandable reaction to engineering failure, but we may be blaming the wrong thing – ready to throw a fine baby possessing a lot of potential out with the bathwater. Soon, no one will dare speak of virtue in one-ways for fear of career-altering ridicule. Rachel Quednau has a great article about problems she sees with a one-way couplet in her neighborhood. It boils down to being too fast. She argues that converting it could be a good way to slow it down and make it safer. It probably would slow it a bit, but other low-cost strategies can slow it also – without losing the good parts of couplets. In another critique of couplets, John Gilderbloom and William Riggs have an insightful piece showing evidence that property-values along older one-ways are much lower than along similar two-way streets. Again, their observations generally boil down to high-speed. So, are one-ways inherently high-speed? Or do these findings simply indict both intentional and inadvertent high-speed designs? Instead of asking “which is better,” let's ask, “Can one-ways be calmed?” If the answer is "yes," then we should look at how one-ways and two-ways differ in terms of their ability to “dance well” with other modes, and promote mixed-use, walkable development. I think one-ways can actually work better than two-ways in many cases for building strong towns. There’s a lot of momentum swinging the pendulum too far against one-ways, so I’ve got a few pieces of material to challenge you with. This articles is Part I, addressing the existing one-ways of pre-war tight grids. Later, I’ll address whether couplets can play a positive role in new urbanist projects at Brownfield, Greyfield, and even Greenfield locations. I’ll probably dig deeper into analysis also. Below, I used the free StreetPlan.net to quickly sketch Existing vs. Restripe. Since Prospect Ave. looks like a drag-strip for half a mile, you feel like hitting the gas. If the community can raise a little more money, minor intersection modifications will force drivers to slow down. Raised table-top intersections with alternative coloring would work. Forced curvature also works. I’m a terrible artist, so I stole a picture of bulb-outs on a two-way street, and modified to show how streetscape extensions (shaded blue) could force one-way traffic to slow down. This could be temporarily achieved with something as simple as a row of cinderblocks to create the blue spaces and some planted pots and lawn-chairs in the voids. Here are several resources for conducting a temporary traffic calming demonstration in your town. Think about downtown Portland, Seattle, San Francisco, Denver, New Orleans, Washington D.C., Manhattan, and dozens of other compact, mixed-use cities here and abroad. What do they all have in common? One-ways are a big part of how they achieved and maintain their compact design. Their tight grids matter, but ever since Henry Ford, the ability for vehicles to flow also matters to buses, trolleys, UPS trucks, cement trucks, taxis, and automated vehicles. Two-ways will simply gridlock at lower traffic volumes than one-ways. It’s physics. When any mode becomes unattractive, the market is hindered and some will build elsewhere – especially if not yet at critical mass for alternative modes to weigh in heavily. Engineers used to focus on both high-volume and high-speed. But you can still have high-volume at low speeds. As Andrew Price pointed out in his Strong Towns article “A case for one-way streets,” traffic and other modes dance well on one-ways in major downtowns because traffic is slow. Pedestrians cross at-will anywhere they want, as they only need a gap in one direction. Mother Nature discovered our blood “network” is best managed as one-way streets: arteries for oxygen, veins for return. “Two-way blood-vessels” would mean high blood pressure and stunted growth. One-Ways… What Kind of Drug Are These? Let’s Discuss! No wise doctor would ever discount all potential uses of a drug just because negative side-effects outweigh benefits if applied incorrectly. In our “bio-engineering” of the urban body, I’m convinced we can apply low-speed one-ways correctly and achieve impressive benefits. But they’re a powerful drug that’s been abused in the past, and too many are too scared to prescribe them. They’re a bit hallucinogenic, and I’m not sure who’s hallucinating the most – me or the critics. Am I missing key weaknesses? Are critics unfairly blaming the wrong thing? Are there cases where conversion makes more sense than traffic calming? I invite you to weigh in, or notify anyone with a lot of experience to weigh in. I’ll respond to comments, and hope you’ll watch for Part 2 with examples of how couplets outside downtowns can help to kill stroads. Mike Brown is a transportation engineer who hopes to kill proposals for new stroads, and convert existing ones into walkable boulevards. He hopes to stop the “build-our-way-out with freeways” temptation by optimizing freeways instead, or downsizing those that just don’t make sense to continue. Mike founded Metro Analytics to pursue those objectives. Metro sponsors InnovativeIntersections.org, where you can discover cutting-edge Place-Making methods for managing high-volumes of traffic at low speeds, and catalyzing mixed-use development. 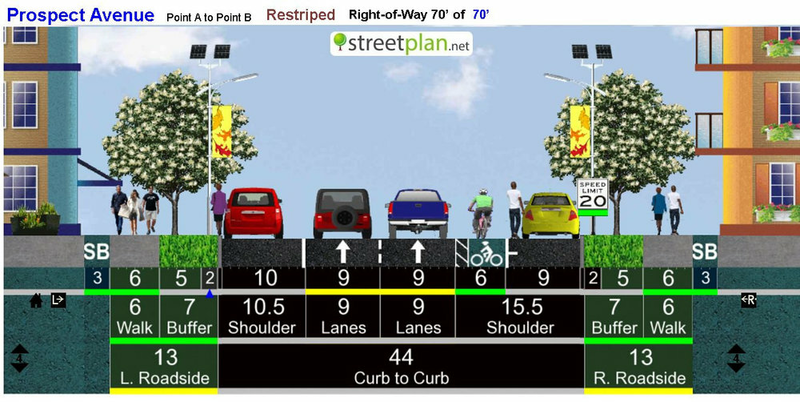 Metro also sponsors StreetPlan.net, a free Complete Street cross-section development tool that follows ITE/CNU best practice guidelines. Mike is based in Salt Lake City, Utah.